Welcome to CodeMonkey’s newest blog: Question Corner with Teacher & Gordo. In these posts, you will learn useful information regarding CodeMonkey’s different courses and content. Each post will have questions from Teacher with answers from Gordo, CodeMonkey’s smartest friend. Enjoy! Hi Gordo, I have a few questions for you today :). What is the difference between the Challenge Builder and Game Builder? 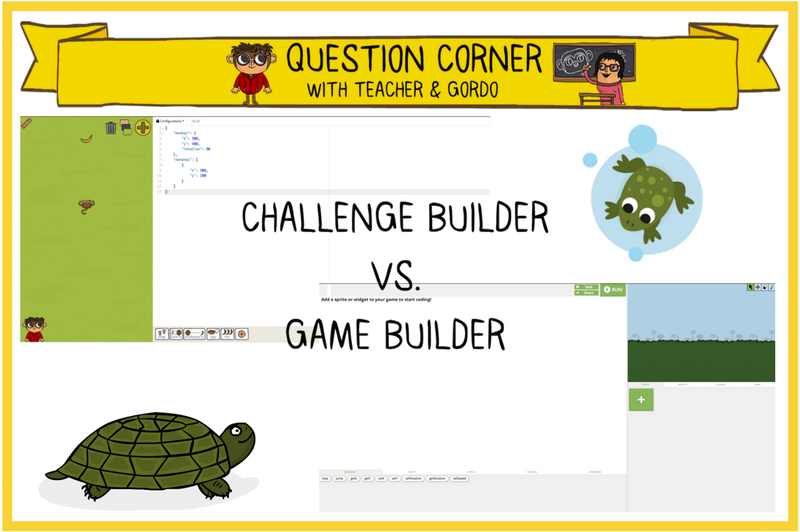 The main difference between the two is that the Challenge Builder provides students and teachers with a platform for building their own challenge, so the code here will typically be shorter than the code needed to build a game. In addition, Game Builder requires added game-like features such as widgets that insert a built-in timer to the game. Another difference is that Challenge Builder provides a semi free-form platform while Game Builder is a completely free-form platform. This means that although you can build your own challenges via Challenge Builder, they will remain in the same theme as the challenges seen in the Coding Adventure. Whereas in Game Builder, you can add your own characters, objects, and backgrounds so you have more room for creativity. Do I need to learn how to build challenges in order to build games? Although we recommend completing Coding Adventure Parts 1 and 2 prior to building your own games, this is not a must. You do not need to build your own challenges prior to building your own games. You do, however, need to complete the Game Design Courses prior to building your own games. How many Coding Adventure challenges do I have to complete before I can build a challenge? This depends on how complex and advanced you want your challenge to be. For example, if you want to create a challenge that requires a loop, then you only need to complete the first 30 challenges of Coding Adventure: Part 1. If you want to create a challenge that requires a more difficult coding concept such as an If statement, then you will need to have completed the first 111 challenges. Where can I access Challenge Builder? To access Challenge Builder, simply scroll down on your home page to the Activities section. There you will see the Create Challenges activity. Where can I see my students’ challenges? To see your students’ challenges, first click on the desired classroom. This will take you to your classroom’s dashboard. From there, click on the Showroom tab, which features your students’ games and challenges. 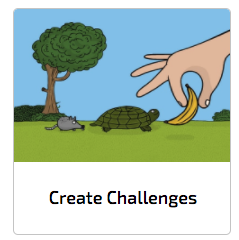 If your students created their own challenges, you will see them under the Challenges section. If one of my students builds a new challenge, can he/she share it with the whole class so that everyone can play it? Yes! To share a game, go to the Showroom tab and click on the challenge or game you wish to share. From there, you can click on share and choose to either share with the class or with the world. Great! Thank you so much Gordo! Talk to you soon.